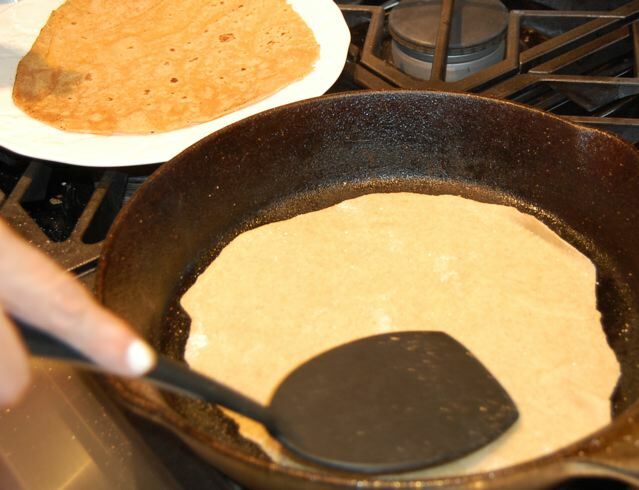 Have you ever tried homemade flour tortillas before? Let me just say that the taste and texture is far superior to those that come in a plastic bag at the grocery store. Those at the store honestly don’t even deserve to be called tortillas compared to the real thing. And luckily, the tastiness of homemade tortillas justifies the effort it takes to make them. Up until now almost all the recipes I have posted have been easy to make, but I must admit that this one is definitely an exception to the rule. I will also say that I actually tried a couple of different methods for making tortillas and this is the easy (easier) version. Please trust me when I tell you…it is worth it! Once the dough has been made it takes me about 30 minutes to roll out and cook a dozen of these tortillas. Everyone in my family (including me) practically scarfs them down as soon as I make them, and if used as wraps they can add some variety to your lunch over typical sandwich bread. My 3-year-old’s favorite combination (which she lovingly calls a “roll up”) is to have hummus and cheese wrapped up in her tortilla. I actually love a “roll up” myself although I usually add diced tomatoes, cucumbers, or spinach to mine. My kids also just like to snack on plain tortillas too and if you have time to make a big batch then you can freeze some for later! Take out the dough and divide it into 12 equal sized pieces. I do this by rolling out a log shape that is about 8 – 10 inches long. Then I cut it in the middle. Then I cut each of those pieces in the middle and so on until you have 12 pieces. Roll each piece into a ball and flatten it out on a baking tray or board. Cover with plastic wrap and let rest at room temperature for at least 15 minutes or up to one hour. On a lightly floured board or countertop, roll each ball into a 8 to 10 inch circle (measure against your recipe if printed on a 8.5X11 sheet of paper). Be careful not to use more than a teaspoon or two of flour when rolling out each ball of dough because too much excess flour will burn in the pan. Spray the pan with cooking spray (I recommend Canola oil spray) and then carefully transfer each tortilla, one at a time, to the pan and cook until puffy and slightly brown, about 30 to 45 seconds per side. Set aside on a plate to cool slightly. Eat within an hour, refrigerate or freeze. very nice and easy to make recipe, however, I have a problem with it. I am Vegan and I am not about to break the rules. What Can I use instead of the oil you suggest? The reason I don’t include oil in my diet is because all oil is fat, no matter where it comes from. Hi there – Sorry I don’t know of any substitutions for the oil in this recipe. As far as I know Avocado Oil shouldn’t break any vegan rules, but I understand you are trying to cut back on oil all together…good luck with that! Thanks for the recipe, I will give it a try and use olive oil instead. Frank- You need healthy fat in your diet. Fat does not make you fat. Consuming excess calories more than you burn in a day is what makes you fat. Olive oil and coconut oil are the two best oil you can eat and you should never shy away from them. However oil is high in calories so it’s always best to eat it in moderation. I am personally not a fan of canola and especially vegetable oil. Organic evoo, or organic extra virgin coconut oil are the best. 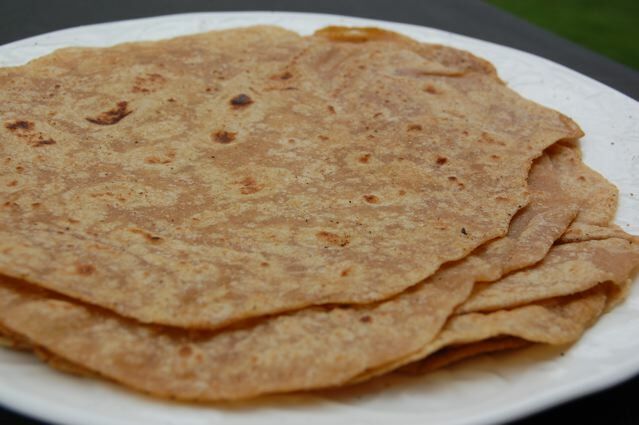 i tried these whole wheat tortillas and they were yummy. i filled them with a thai chicken with mango salsa, a recipe that i really love. i will never buy another tortilla from the store again. thank you for this recipe. I am so glad to hear that! And I have to agree…once you try these you get spoiled and cannot buy them from the store again. I am making these again for the 7th time now. I just can’t get enough! Everyone I make them for loves them, of course I always give you the credit. Tonight I am making some homemade Spanish brown rice and throwing a little habanero cheese, lettuce and tomato inside. My version of a vegetarian burrito. I will skip the habanero cheese for the kids. Love it! So glad I got you hooked 🙂 Thanks for the comment! Thank you so much for this recipe (and this blog!) I can’t wait to try it. Quesadilla’s are one of the things my picky 2-year-old will eat and a good way for me to sneak in veggies and protein…but I’ve been dismayed at the long list of ingredients for store-bought whole wheat tortillas. Can’t wait to try to make these! Try spreading some roasted butternut squash or cooked sweet potato on the tortilla before adding the cheese for quesadillas…adds a nice flavor and lots of other goodness too! These are incredible! So much better than store bought. Thanks you for sharing. How well do these freeze? Do you have any suggestions for freezing them? I need to make enough for my family gathering of 20 people… so probably at least 40-50 tortillas. I’d like to make the dough and get them ready before we drive 4 hours to our gathering location… thoughts? ideas?? Yes, they freeze beautifully! Just put them in freezer safe gallon zip lock bag. I do it all of the time 🙂 Just take them out the night before and you will be good to go. Also they are best if just slightly heated before serving. Okay, I’ve tried making these tortillas twice now, and both times, the dough came out super sticky and wet. What am I doing wrong? Do I not need to add the whole cup of water? I am so sorry to hear that! But you are right on track…if the dough is too sticky/wet then it is too much water. You can either add more flour or use less water. I usually pour in the majority of the water and then look to see if it needs the last few drops. Sometimes it does and sometimes it doesn’t. I will add a little note about this to the recipe! I hope you give it one more shot because they are so worth it! on October 10, 2010 at 1:33 pm | Reply Kris J.
what if you dont have a dough hook to make these with? any suggestions on making them by hand? I definitely think you could make this dough by hand…just stir until it is mixed well enough for you to knead it by hand a little. I know you posted this forever ago but I made these last weekend and the taste is, of course, so superior to store bought tortillas I am definitely hooked! I do have a question though, the tortillas hardened the longer they sat and I refrigerated mine and I re heat them in the microwave wrapped in a damp paper towel. I was wondering if they are supposed to be softer in order to wrap. If so did I do something wrong to make them turn out hard? I have found that if I don’t have the heat up high enough and the tortilla is in the pan too long before it gets brown they can be a little more stiff. When you are cooking them they should start to get brown very quickly…within a minute (on each side). Also, after they’ve been in the refrigerator I heat mine in the microwave to make them even softer, but I only heat them for 5 or 8 seconds (for 1)…so make sure you don’t overheat it when reheating. I hope that helps! This is a follow up on my last email, I wanted to know if you had a replacement ingredient to be used instead of all the oil you use in making these tortillas. Well, I found the secret ingredient and it works better than expected: Soy milk. Instead of using the fat to wet the flour, I use the same amount of soy milk and it works fine. The tortillas are fluffy even before you cook them. Now this dish is truly a Vegan dish. Thank you. Did your tortillas turn out hard or soft? Good to know Frank…I will have to try that! Thanks Lisa for this amazing recipe! I’ve never tried to make tortillas before and was surprised at how easy it was. I made them a couple days ago using the cookie dough/pasta option of my bread machine. The taste was awesome and we loved them. We had the last few this morning using them to wrap our peppers/spinach/feta cheese omelet and it was fabulous. I’m making more todayThanks for sharing the recipe and thanks for your blog! My daughter is on a gluten free diet and I was wondering if anyone has tried this with the gluten free flours out there and how it worked out. I have not, but I think it would work! Just make sure the dough is not too sticky/wet or dry to make sure you are using the right amount of flour. You might need slightly more or less flour depending on what type you use. DrMcdougall.com is the place where you will find many answers about eating without fat of any kind. There are many doctors that subscribe to this believe, I have been vegan (no oils of any kind) for 2 years and I cold not feel beter. I am 72 now. I think I did something wrong, (maybe it was my flour?-Stone ground) Anyways my tortillas came out very brittle, If I roll them to make a wrap or burrito they’ll just crack.